I always get excited about cookbooks that include great tip and techniques. When things are explained in ways that give you choices for customizing recipes and make you understand what affect those customizations will have, it’s eye-opening. Dan Lepard’s latest book, Short and Sweet: The Best of Home Baking , is full of tips just like that. It was published in the UK in 2011, but the US version was just recently released. When I received a review copy, I couldn’t put it down. The Tips and Techniques at the beginning of each chapter not only give you details about ingredients, baking times, etc. they also lead you along the way to making your baked goods your own. For example, when you know how salt, sugar, and different liquids affect bread dough, you can start tweaking recipes for the results you want. In the cake chapter, there are so many recipes I want to try, I might just have to start at the beginning and bake my way through it. The Carrot, Orange and Pistachio Cake is a nice twist on classic Carrot Cake; the Coffee and Ricotta Marbled Cake includes a great tip to prevent it from sinking as it bakes; and I have to try the Marrakesh Express Loaf Cake made with coffee, cardamom, cinnamon, pomegranate syrup, and dates. There are cookies and crackers, doughnuts and crepes, frostings and variations on buttercreams, pies and tarts and steamed puddings, and candies like lovely caramels. And, somehow, after reading about all those delicious sweets and looking at all the tempting photos, I ended up making a savory recipe first. When I saw the page for these Black Olive Gourgeres, I realized it had been far too long since I last made gourgeres, and this version was very different from any I’d ever made. You start by quartering pitted Kalamatas and combining them with a minced garlic clove, some chopped, fresh rosemary, olive oil, and salt and pepper in a saucepan. Yes, these gourgeres are made with olive oil rather than butter. When the olive mixture comes to a boil, flour is added and stirred until it forms a ball. It’s at this point in the process of making choux paste that I usually take a tip from Ina Garten and transfer the dough to a food processor for mixing in the eggs. It’s much easier than beating them in by hand. However, with the nice chunks of black olives in this dough, I didn’t want the blade of the food processor to reduce them to tiny bits. I still took a lazy approach by mixing in the eggs one at a time with a hand mixer. Grated parmesan was mixed in as well. 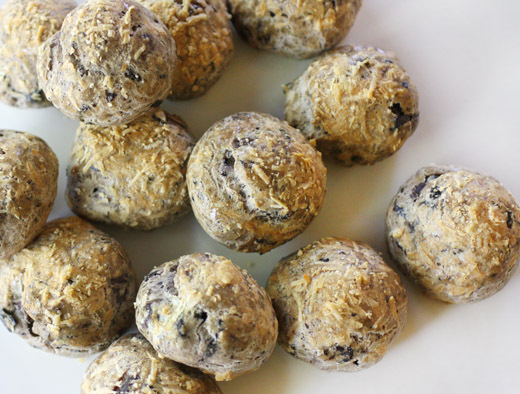 The size of the gourgeres is up to you, and the recipe includes baking times for smaller, olive-size ones and for larger tablespoon-size ones. I went with the larger size. I brushed the gourgeres with egg wash and sprinkled the tops with more grated parmesan before they went into the oven for about 25 minutes. They were puffy and light just as gourgeres should be, and the black olives and parmesan made them delightfully savory. These were perfect little treats to accompany a cocktail. In the section of the book on choux paste, there’s also an interesting suggestion for making the dough into tiny pea-size pieces for sprinkling over soup or salad like croutons. I wasn’t kidding about all the smart tips in this book. Lisa, these are great snacks! Never had or heard of gourgeres before, so thanks a million for sharing these and the cookbook! This is just my kind of pastry! I can imagine how these bite-size gourgeres are puffy! And it's a brilliant idea to top soups with these cute puffs! Perfect with a glass of wine and great party food! how creative - i love gougeres but never seem them with olives - gorgeous! Sounds like a great recommendation! What great party appetizers! Love the add of black olives. These are really a special treat. Wish there were more pictures though. They look absolutely delicious. Could you post the recipe? I only post recipes from books with publisher's permission. This time, I was not able to include the recipe. As a matter of interest I googled and found the recipe in the Guardian under Dan Lepard's byline. Definitely have to make this! Yes! Another commenter found the link as well. Hope you enjoy! What a terrific idea! 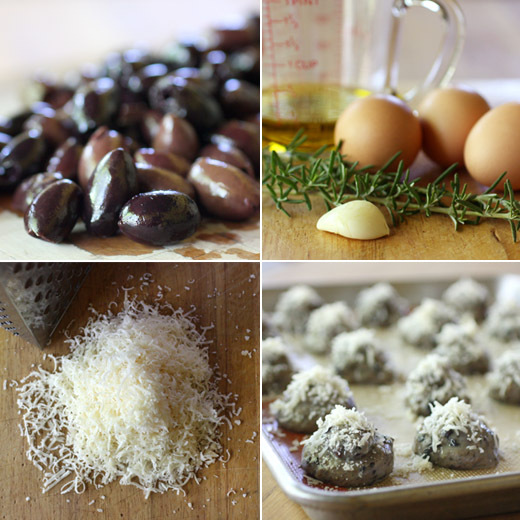 I've never made gourgeres with either olive oil or olives, but I love the idea. Definitely something I should play with! Good stuff - thanks. What a great cookbook review AND stellar recipe! I have so many cookbooks now I am trying to be selective about any new additions. I must purchase Short and Sweet! The recipe can be found by searching on Google.....I hope this is ok to post. These gourgeres look terrific - and I'm hoping you'll make the Marrakech Express loaf cake sometime soon too! I also love it when cookbooks have random tips throughout that are helpful. These definitely look tasty! Love kalamata olives..they've always been a favorite of mine. These are so sweet Lisa :) I adore them. They would be so good with a slop of butter. What a great little appetizer for a cocktail party! Lisa, I love Lepard's book! It's one of my favorites. His butterscotch banana cake is the best banana cake I have ever made or tried. I think you should give it a go. I cannot stop thinking about olives lately. These gourgeres sound perfect to add to my repertoire. That cookbook sounds awesome! I love it when I learn something along with a recipe. 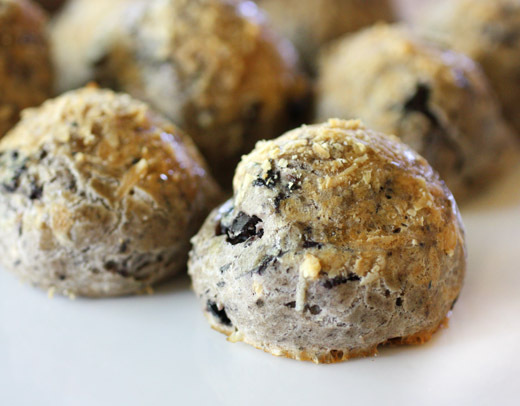 Gougeres are on my to-make list and the olive mix-ins are a great addition! Little bites of YUM. That is a favorite book of mine! Fantastic, and indeed all recipes in the book are available from the Guardian site. I love cookbooks, need to look for this one and check this fabulous recipe.